Our C++ Programming Tests allow you to experience an online examination in the real-time environment. In every online test on C++ Programming, you will be presented with Multiple Choice Questions (MCQs) which will test your skills in C++ Programming Concepts in a detailed and comprehensive manner. In the test, each question will have 4 options to choose from. You should select only 1 correct option as an answer and then move on to the next question. Once you submit answers to all the questions, you will be given your final test score. In the Online C++ Programming Test, for every correct answer, you will be given 2 points. There will also be negative marking of -1 for every wrong answer. So, you will have to be more careful in choosing the answers to the question in your online examination. If needed, you should skip to the next question and come back to the previous question later so that you can do proper time management for the online mock tests. 1. "C++ Programming Practice Tests" - In C++ Programming practice tests, there will be a series of practice tests wherein you can test your C++ Programming concepts on every chapter separately. There will not be any time limit on these tests. So, C++ Programming Practice Tests should be the first set of tests which you should attempt. Goto these practice tests here. 2. "C++ Programming Mock Tests" - In C++ Programming mock tests, there will be a series of mock tests wherein you can test your C++ Programming concepts on every chapter separately, but there will be a fixed time limit per test. So, it is similar to C++ Programming Practice Tests, but with an added constraint of time limits. 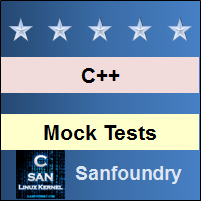 You should try C++ Programming Mock Tests if you are appearing for any online examination soon. Goto these mock tests here. 3. "C++ Programming Certification Test" - Once you are through with your C++ Programming concepts, then you should try our C++ Programming Certification Test wherein Sanfoundry will issue a free Certificate to you if you scored either Grade A* or Grade A in C++ Programming Certification Test. Goto C++ Programming Certification test here. 4. 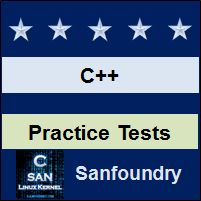 "C++ Programming Internship Test" - If you are interested to do Internships in C++ Programming at Sanfoundry, then you must take our C++ Programming Internship Test. If you scored either Grade A* or Grade A in C++ Programming Internship Test, then you are eligible for Internship at Sanfoundry in C++ Programming. Goto C++ Programming Internship test here. 5. 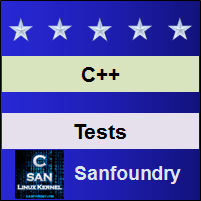 "C++ Programming Job Test" - If you are a fresher, a dropout, an experienced person and if you know C++ Programming well and looking out for jobs in C++ Programming domain at Sanfoundry (or our Network of Companies), then you should try and qualify our "C++ Programming Job Test". 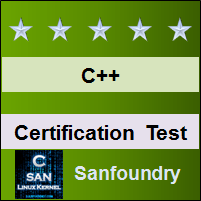 If you scored either Grade A* or Grade A in C++ Programming Job Test, then you are eligible for a Job at Sanfoundry (or our Network) in C++ Programming domain. Goto C++ Programming Job test here. For every "C++ Programming Practice Test", Total Questions: 20, Total Time: Unlimited. For every "C++ Programming Mock Test", Total Questions: 20, Total Time: 20 Minutes. For "C++ Programming Certification Test", Total Questions: 50, Total Time: 1 hour. For "C++ Programming Internship Test", Total Questions: 50, Total Time: 1 hour. For "C++ Programming Job Test", Total Questions: 50, Total Time: 1 hour. Before you get started on these series of online tests on C++ Programming, you should learn, study and practice our collection of 1000 MCQs (Multiple Choice Questions and Answers) on C++ Programming here. We also prefer that you should practice C++ Programming practice tests and mock tests completely before attempting the certification test. Here is the list of online practice tests and mock tests on C++ Programming. Each online test focuses on a "Specific chapter of C++ Programming". So, you should try both practice test and mock test on every chapter to do a self-assessment of your knowledge (along with time-limit constraints) in every area or sub-topic of C++ Programming. C++ Programming Certification test, Internship test, and Job Test are mentioned at the end of this list. 1. C++ Programming Test 1 – This set of online test on “C++” tests your skills on Types, Booleans, Character Types, Integer Types, Floating Point Types, Sizes, Void, Enumerations, Declaration, Pointers, Arrays. 2. C++ Programming Test 2 – This set of online test on “C++” tests your skills on Pointers into Arrays, Constants, References, Pointer to Void, Structures, Operators, Statements, Comments and Indentation, Function Declarations, Argument Passing, Value Return. 3. C++ Programming Test 3 – This set of online test on “C++” tests your skills on Overloaded Function Names, Default Arguments, Unspecified Number of Arguments, Pointer to Function, Macros, Modularization and Interfaces, Namespaces, Exceptions, Linkage, Header Files Usage, Classes. 4. C++ Programming Test 4 – This set of online test on “C++” tests your skills on User Defined Types, Objects, Operator Functions, Complex Number Type, Conversion Operators, Friends, Large Objects, Essential Operators, Subscripting, Function Call, Dereferencing. 5. C++ Programming Test 5 – This set of online test on “C++” tests your skills on Increment and Decrement, String Class, Derived Classes, Abstract Classes, Design of Class Hierarchies, Class Hierarchies and Abstract Classes, Simple String Template, Function Templates, Template Arguments to Specify Policy Usage, Specialization, Derivation and Templates. 6. C++ Programming Test 6 – This set of online test on “C++” tests your skills on Error Handling, Grouping of Exceptions, Catching Exceptions, Resource Management, Exceptions That are not Errors, Exception Specifications, Uncaught Exceptions, Exceptions and Efficiency, Error Handling Alternatives, Standard Exceptions, Class Hierarchies Introduction. 7. C++ Programming Test 7 – This set of online test on “C++” tests your skills on Multiple Inheritance, Access Control, Run Time Type Information, Pointers to Members, Free Store, Standard Library Design, Container Design, Vector, Sequences, Sequence Adapters, Associative Containers. 8. C++ Programming Test 8 – This set of online test on “C++” tests your skills on Almost Containers, Defining a New Container, Standard Library Algorithms, Sequences and Containers, Function Objects, Nonmodifying Sequence Algorithms, Modifying Sequence Algorithms, Stored Sequences, Heaps, Min and Max. 9. C++ Programming Test 9 – This set of online test on “C++” tests your skills on Permutations, C Style Algorithms, Iterators and Sequences, Checked Iterators, Allocators, String Characters, Basic String, C Standard Library, Output Stream, Input Stream. 10. C++ Programming Test 10 – This set of online test on “C++” tests your skills on Formatting, File Streams and String Streams, Buffering, Locale, C Input Output, Numeric Limits, Standard Mathematical Functions, Vector Arithmetic, Generalized Numeric Algorithms, Random Numbers. 11. C++ Programming Certification Test - This set of online free certification test on "C++ Programming" tests your skills on all areas (all chapters, topics and subtopics) of C++ Programming. 12. 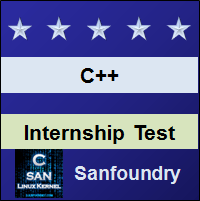 C++ Programming Internship Test - If you scored either Grade A* or Grade A in our C++ Programming Internship Test, then you can apply for Internship at Sanfoundry in C++ Programming. 13. 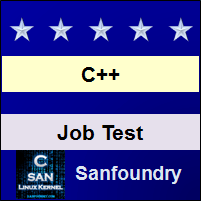 C++ Programming Job Test - If you scored either Grade A* or Grade A in our C++ Programming Job Test, then you can apply for Jobs at Sanfoundry in C++ Programming domain. Best Wishes for your C++ Programming Tests!